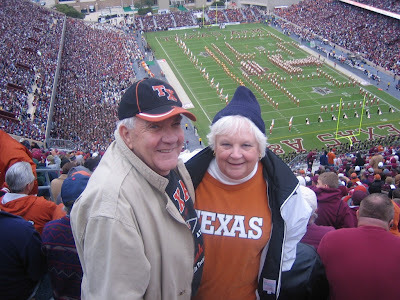 That's my folks all giddy before the Texas vs Texas A&M football game at Kyle Field 2007. Since them dad gum Aggies upset the mighty Horns that day, good thing I snapped this one before kickoff. Them smiles left the building somewhere late in the fourth qtr. Mom met dad while attending Texas in the early 60's. UT sports have been a part of our lives ever since. Actually, just about any sport and any game will grab mom's attention. I've walked into her TV room and heard her bemoaning how Jeff Bagwell strikes out too much with runners in scoring position. She can cheer on Lance Armstrong and knows the words to "My Old Kentucky Home". In Olympic years we hire a cook and a cleaning service for those two weeks. Mom duties are suspended while she's glued to Curling or the Nordic Combined. Mom led an online NFL game picking contest for the entire season one year. She devised a spreadsheet of stats and created a macro that spit out who would win what game with alarming success. In the last week, when the Cowboys and Patriots rested their starters to get ready for the playoffs her data driven selection process let her down. She spent a little time looking for Jerry Jones' telephone number so she could explain what he had done to her season rankings. In her mustang convertible with top down we drove home from the Summit arena in Houston celebrating the Rockets knocking out the LA Lakers to win the Western Conference championship in 1986. We chanted "Beat LA, Beat LA" the whole time. Bridge, Boggle, Poker, Trivial Pursuit, Mexican Train, Dark Tower, are just some of the games that she desires to beat your brains in. But after celebrating a victory or cursing a defeat she'll go get you a piece of cake. One that she made herself no doubt. So the gamer and foodie in me came from Mom. It's a good day for us all to think about how we got here. To all the mom's and particularly mine a big thank you.